FADOA DONATES UNIFORMS TO CHILDREN IN WUM-CAMEROON. In February 2016, FADOA donated uniforms to 60 primary and secondary school AIDS orphans in Wum Cameroon. The children were selected by our Partner in Wum, Charity Mothers Association. This association arranged for the sewing of the uniforms and eventually given to the children. FADOA is an international AIDS CHARITY with HIV & AIDS projects in Africa. Our HIV and AIDS projects have a particular emphasis on sustainable, cost-effective community responses to HIV & AIDS. Each HIV and AIDS project is developed and run according to the specific needs of the area by people who are local to the area. 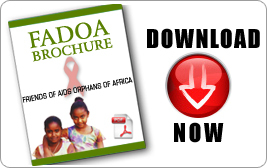 This page outlines some of FADOA's HIV & AIDS projects in Africa. An online knowledge-based resource centre to initiate a sharing and learning process among Africa HIV/AIDS FADOA and its NGO partners. It contains resources related to HIV/AIDS, Gender, Government and international donor policies related to development issues. FADKAT is working with a partnering CBO in a remote rural area known as Ngorano location. The CBO known as the Edith and Justus Kahiga PCEA Ngorano Memorial Orphanage in short the Ngorano Memorial Orphanage, FADOKAT assists orphans with school uniforms and school materials. In response to the appeal by Ngorano Memorial orphanage, FADOKAT reached out to 25 orphans ranging from pre-school to high school and assisted them with school fees and school uniforms for the year 2016. Both are a requirement for attending school. FADOKAT also provided a pair of shoes each for the 25 children who otherwise would have attended school bear foot. Other school materials provided included exercise books, pens and pencils, rulers, erasers etc. For some of the older girls, hygienic pads were also provided to facilitate their continuous school attendance. Distribution of the above materials ensured that each of the 25 children will attend school in 2016 without interruption.